Hello there everyone...I'm so happy you're here! If you are reading this, then you might be having a little trouble sorting through the different ways to enter all of the many blog contests out there. Because you're reading this on my blog, I'm assuming that you'd really like some clarification with how to enter my contests specifically, though my entries are pretty much like the other blogs' contests you'll run across. I used to avidly enter sweepstakes contests, until I ran across blog contests. The odds of winning some fabulous prizes are so much better here, but the rules for entry are very different, since blog contests focus so heavily on social media as ways to enter. Step 1: Always follow the MANDATORY ENTRY very carefully and always complete it FIRST! Please tell me the article of clothing you would choose, if you should win this giveaway. "I really like the purple shirt and I am following you via Google Friend Connect (your google name)"
That's it! Now, you're officially entered. You could stop there if you'd like with one entry into the contest, or if you want to earn more entries, just start reading the OPTIONAL ENTRIES section immediately following the MANDATORY ENTRY. Step 2: Complete the OPTIONAL ENTRIES and remember to always leave your user name and/or posting link, so that I can verify your entry! "I follow XYZ Clothing on Twitter (@your Twitter username)"
"I follow @MommyLTLORiley on Twitter (@your Twitter username)"
"I follow Toothpaste 2 Go on Twitter (@your Twitter username)"
"I like XYZ Clothing on Facebook (your Facebook username)"
This is the same kind of comment you should leave by liking either Mommy Living the Life of Riley on Facebook or Toothpaste 2 Go on Facebook. Just remember to always leave your username, so that I can find you to verify your entry. "I like Mommy Living the Life of Riley on Facebook (your Facebook username)"
"I like Toothpaste 2 Go on Facebook (your Facebook username)"
Optional Entry #3: Writing the specified message on the sponsor's Facebook wall and leaving the direct link in your comment. There you have it! That's all you need to write for this entry! Optional Entry #5: MULTIPLE ENTRIES GET MULTIPLE COMMENTS! "I subscribe via email (your email address) - Entry #1"
"I subscribe via email (your email address) - Entry #2"
That's it! I hope you are now equipped to win some serious prizes from all of the wonderful blog contests out there! GOOD LUCK and thanks so much for stopping by and entering the contests at Mommy Living the Life of Riley! Have a wonderful day! This helps anyone not familiar with entering contests. This is great! 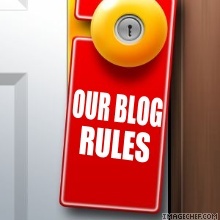 Would you mind if I used these rules on my blog? I will have to change a few things but I will link back to your blog! Let me know! Hi, I’m probably making this harder than it is, but I’m getting frustrated trying to do the mandatory items in order to enter the contest. First, how do I tell you the article of clothing I would choose? Secondly, I opened a Google email acct, but lost as far as what to do from there (following blog via Google Friend Connect)?? Please help!!! Thanks so much for stopping by! Okay, in order to do the mandatory entry for any contest, just go to that particular contest and do what it says there. Then, leave me a comment on that contest answering whatever question or doing whatever task I asked of you for the mandatory entry. There are also optional entries for every contest too, so if you want more than one entry to the contest, just complete the optional entries and then leave a comment on that contest for each one you completed. Blog giveaways are a lot like raffles. The more raffle tickets you have, the greater your chance of winning. Each entry you complete should get one comment or raffle ticket to that contest. As for the Google Friend Connect part, now that you’ve signed up for a Google account, go to my blog’s sidebar and find the section entitled “My Google Friends!” and click the “Follow” button. If you are signed in to Google, you will automatically become a Google Friend. If not, Google will ask you to sign into your account then and you will be following me then.